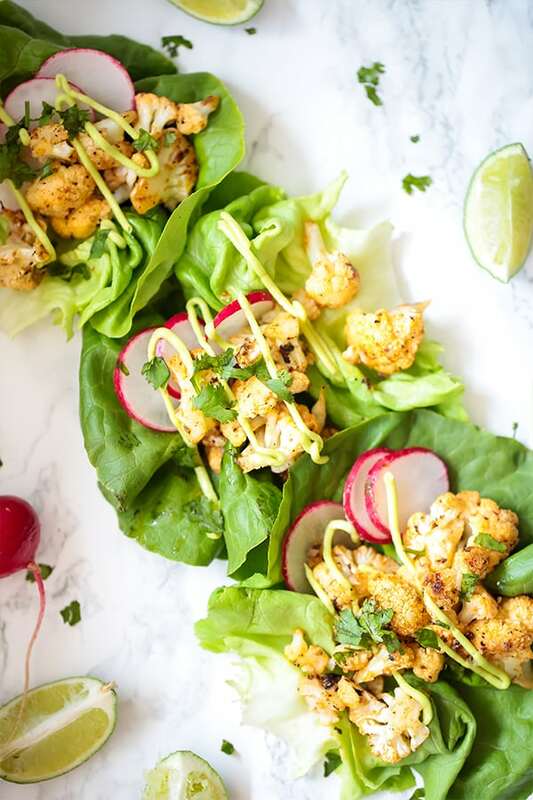 These bang bang cauliflower tacos are an amazing plant-based appetizer or side dish! They’re paleo, whole30, AIP, and even Vegan! When I first started transitioning to a more paleo diet, I was wary of having protein at every single meal. I had been lower protein for so long that I wasn’t used to the idea, nor was I used to the extra expense of high-quality protein. However, not everything has to have animal protein in it! Not every appetizer has to be bacon wrapped dates or cocktail meatballs. Veggie-packed side dishes are such an amazing way to add more vegetables to your diet, save money on protein, and include plant-based family and friends in your meals. 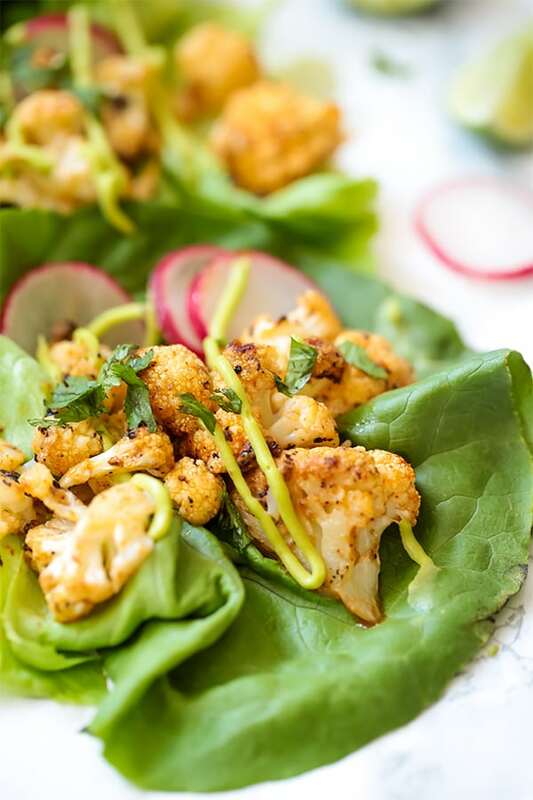 These bang bang cauliflower tacos are packed with flavor, fiber, and nutrient dense veggies! They’re so perfect to serve as a fun appetizer or side dish and will be sure to please crowds of all diet types. One medium head of cauliflower chopped into florets is what you’ll need for this recipe. These work great as the lettuce cup tortillas, but you could also use a compliant tortilla. A crunchy kick in the tacos. The bang bang sauce will vary depending on whether or not you’re AIP. I have two options for a nightshade-free sauce and a whole30/ paleo sauce. This simple avocado crema is made with minimal ingredients and can be used to a variety of different recipes! For the bang bang sauce, combine all of the ingredients in a bowl, mix well, and set aside. For the avocado crema, blend the ingredients in a high-speed blender until creamy and set aside. Toss the cauliflower florets in the bang bang sauce of your choice until well coated. Evenly space the cauliflower florets on the baking sheet and bake for 25-30 minutes, or until baked through. Prepare the lettuce cups and layer in the cauliflower, chopped radish, and cilantro. Finish with a drizzle of avocado crema on all of the tacos. Serve as an appetizer or side dish and enjoy!